DOTHOME Review 2019: Is DOTHOME a Good Hosting? Dot Home is part of a long standing group of South Korean internet hosting companies. The customer service is limited and there’s no uptime guarantee mentioned, however, the plans are popular and have the choice of SSD and HDD. Dot Home is part of group of website hosting companies; AnySecure, Let’s Hosting, and Dot Home. Dot Home uses AnySecure’s South Korean based data center to power its packages. The website is available in Korean and it has a very popular Facebook page, with more than 40,000 followers. There are two main types of shared hosting plans, Linux and Unlimited. All of the plans run on Linux operating systems with Apache web server, SSD storage for faster disk read / write speeds, and robust Cisco equipment. The infrastructure appears solid, so it’s odd that there’s no uptime guarantee or expected availability advertised. I tried to get confirmation from support, but unfortunately did not hear back. The plans come with support for CGI/Perl, PHP (up to version 7, dependent on plan), and Python, as well as the usual database features e.g., MySQL, phpMyAdmin, and FTP access. Remote SQL connections are not allowed, if that’s important to you, while Cron jobs and SSH access are allowed, so you can keep your site running smoothly. There’s a three step backup system; Step one is the use of RAID 5 and 6 disks to prevent data loss, Step two is the addition of a separate backup disk to retain data for a minimum of three days, and finally, Step three is data backup at a remote location via a separate network. It’s nice to see a company that is serious about keeping your data secure. In terms of beginner-friendly features, for an additional fee, there’s an in-house website building tool, which you can demo easily before you buy, or even take advantage of the 30-day free trial. It’s less clear whether there’s a one-click installer, again I wasn’t able to get confirmation from support. There’s a wide range of prices ranging from free to very expensive. The free plan comes with up to 300MB disk space and 300MB traffic, and each user can open three free accounts. To date, more than 600,000 people have used the free hosting service, however, it’s likely a gateway into the paid product as the resources are low. You can purchase the plans in terms ranging from three months to two years and there’s a seven day grace period in which you can ask for a refund in full. There are also lots of promotions on the website, so make sure to check which plans qualify for which discount before purchasing. 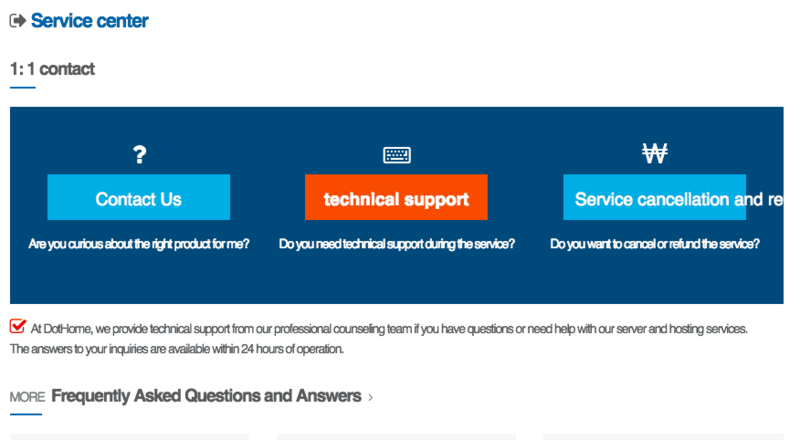 There’s 24/7 customer service by phone and email, as well as a satisfactory FAQ section on the website. A lot of the support pages require existing customers to login, so there could be more resources available once logged in, but I cannot confirm. I contacted the team at around 3:30 p.m. local time on a Wednesday and despite waiting two business days for a reply, I did not get one. That said, I emailed in English, so perhaps that was a blocker for this Korean language website. Dot Home provides South Korean hosting with HDD and SSD. There’s no uptime guarantee, but the plans include most of the features you need to get started, plus there’s a free plan (with limited resources), so you can try before you buy. Get South Korean hosting at DotHome! Wondering how DOTHOME stacks up against other Web Hosting companies? Enter any other Web Hosting company and we will give you a side-by-side comparison.